The origin of “Nilgai” comes from Hindi, the language of India, and means “blue bull.” Although the males are gray to brownish gray, as they approach maturity, they sure enough look blue. The very pretty females and their brood are brown to orange or yellowish brown. Males and females have white areas on their face, under their lips, their bib, and underbelly. Below their neck bib is a signature tuft of hair. Their mane is short and stiff. And big…the males weigh anywhere from 260 to 530 pounds, with some mature bulls tipping the scales at 600 to 1,000 pounds. Their thin legs hold up a very strong body, 6-6.5 feet in length, which slopes downward from the shoulders. They grow to a height of 4 to 5 feet. They can live up to 21 years as long as it doesn’t get too cold. Nilgai have only a thin coat and they don’t store up any fat for winter. Normally, only the male sports horns. Nilgai horns are short and smooth and arch back and forward, like quotation marks. The average size is 8” but they can grow to trophy size of 8.5” to 11”. 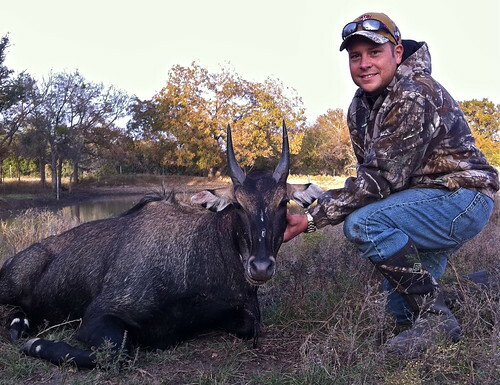 Hunting a big trophy Nilgai can prove to be quite the challenge. Nilgai antelopes have as good or better eyesight and hearing as whitetail deer. They also have an almost eerie sense of danger and spook easily. Once you’ve shot one, don’t necessarily expect it to fall down. Nilgai have a thick elastic hide that seals up over a wound, so it’s hard to track them even once they’re hit because no blood is spilled. Are they worth the trouble? You bet they are! 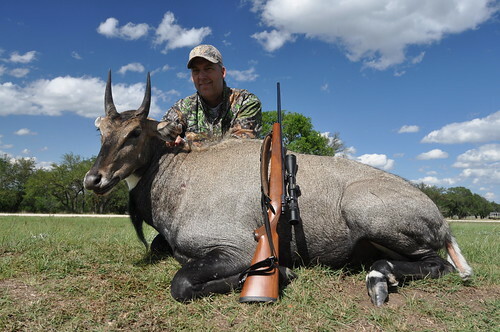 Nilgai hunting is one of the most challenging exotic trophy hunts we offer. Their meat is divine with a flavor milder than beef. Texas state testing panels have concluded that Nilgai meat is just as “tender and tasty” as red deer venison. They have a low fat content – less than 3% versus 12% for beef, and have 1/3 the fat of chicken. With one of our Nilgai hunting packages you get not only a trophy, but a freezer full of delicious and healthy meat!